Bradley knows that Mark and I are interested in trying out more kinds of wild game, so he kindly brought a squirrel to work with him Wednesday morning. He had shot it the night before, so the body had gone stiff overnight in the fridge and took five minutes to skin --- a long time compared to the one minute Bradley estimates it usually takes him. After Bradley illustrated the proper skinning and cleaning technique, we chopped the carcass up into thirds as suggested and boiled the meat to provide our lunch. Unfortunately, neither Mark nor I were thrilled by the taste. I could have spiced it up relatively easily, but wanted to get an idea of what squirrel really tasted like, so left it plain. I'm not sure our analysis of the flavor was really fair, though. When I was able to pretend I wasn't eating squirrel, I thought it tasted a bit like chicken, but for some reason the idea of eating a squirrel didn't sit well with me. I don't think Mark was able to divorce the idea of "squirrel" from what was on his plate at all. In a pinch, I'm now confident that I could skin and gut a squirrel, and I suspect that hidden in a pot of vegetable soup, neither of us would have any complaints about squirrel meat. But for now, we're going to stick to cultivated meat and venison, with the idea of rabbit still floating around for later. Our chicken waterer lets you leave town for the weekend without worrying about your flock. I had squirrel on a regular basis as a kid. My papaw and I used to squirrel hunt in Novemeber, mamaw would put em in the freezer. Not one of my favoite meats, but I could eat my weight in mamaw's squirrel gravy and baked sweet potatoes. I think what made it so good was mamaw cooked on an old woodstove. Enjoy your site much. As a person who has pet rats, I don't think I could ever consider eating squirrel. They're too cute, too smart, and too much like pets for me to think of them as food. Rabbit is also outside my food vocabulary. I'm a softie. That said, the pictures of the squirrel being cleaned didn't bother me at all, but that's probably because I spent some time studying to be a Vet Tech. Chicken fried squirrel is awesome! I always thought it tasted a lot like jackrabbit, kind of sweet and gamey. I don't have a problem with eating them because they are the biggest animal garden nuisance around here. They devour melons, berries, tree fruits, and nuts. You're setting up any meat for failure by boiling it for your first taste. I'm not a huge fan of squirrels but you're really not doing it any justice by simply boiling it. In my neck of the woods, we would call that squirrel a Ground Squirrel. They live in the ground and have an earthy flavor. Not favored in my home. We also have, the silver tree squirrel that has a better meat flavor. You may want to check and see if you have silver squirrels in your area. Fun to hear everyone's pro and anti-squirrel-eating sentiments. Bradley did suggest frying the squirrel up as another option, but he also said it might be a bit tough since it had sat overnight and rigor mortis set in. In retrospect, what I probably should have done was roast the squirrel, which is how I make tough chickens delectable, but first I need to do some work on the mental side of eating squirrel. It would definitely help if they were problems in our garden --- that's how deer came to taste so good. Mona, no ground squirrels over on Anna's side of the US. That's a grey squirrel if I'm not mistaken and a little larger than the ground squirrel. Anna, do you have the red squirrels over there or just the grays? Heath --- We don't have red squirrels (not quite high enough elevation), but do have the occasional fox squirrel, which is like the gray squirrel but bigger and redder. You made them sound kinda yummy, even with your mental reservations. Squirrels cause such problems in our garden. When we dispatch one, another seems to take its place within days. We always joke about getting the crock pot ready.....but we haven't tried one yet. I tried rabbit for the first time last year and liked it, so there's a chance I would not mind squirrel. I might try it next spring; It feels kind of disrespectful wasting them. Do you think resting the meat for 48 hrs. would make let the rigor pass like it does w/ chicken meat? I definitely think that letting the meat sit in the fridge for a couple of days would help with toughness. I don't know why I didn't do that --- too excited, maybe? Charlie --- I just realized that you're our Charlie from the library! Thanks so much for dropping by! I have always seen it prepared breaded & fried (which I don't care for) or cooked to death in a crock pot which is alright. No matter how you fook it, it t is still a tree rat IMHO: One meal a year is plenty for me! My mom used to cook squirrel and rabbit that dad brought home from a hunt. She would put it in the pressure cooker with tomatoes, onion and other seasonings. We would eat it with polenta (corn meal mush). Sometimes she would fry rabbit like chicken then finish it off in the pressure cooker. The pressure cooker made it very tender and tasty. This was the in the 50s & 60s when we had it regularly and I am not sure I would eat squirrel or rabbit today with all the toxins in the world. 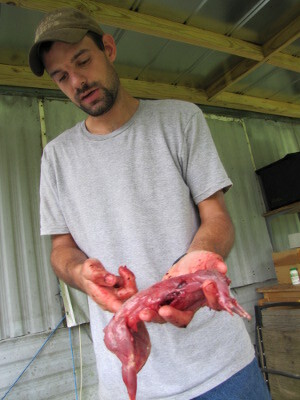 Domestically grown rabbit would be good I think but God knows what they are out there eating in the wild these days. But it sure was good back then. Phil --- Sounds like you've eaten quite a few of those tree rats anyway. So some of my friends in Texas are into eating squirrels. They've basically cut out most meat except what they hunt themselves -- which is a trick in suburban Abilene. Fortunately, their yard has a lot of squirrels. Want me to ask for their recipes? It turns my stomach, but they swear it's tasty and have fed squirrel to friends who say the same. On another note, you mentioned feeding the carcase to Lucy. My dog book said not to give dogs any kind of bone -- hollow or otherwise -- because they can carry diseases. But it didn't specify whether this is only a problem with factory-raised buy-in-the-store meat. Or if it's just for seriously up-tight pet owners. Or what. But I've been good and done what the book says -- Rebecca only gets raw hide chew sticks from the pet store. (And of course, any disgusting thing she finds for herself and gnaws.) Any thoughts on this one? Heather --- I really appreciate the recipe offer, but it was hard enough to trick Mark into trying squirrel the first time. I think it might be in his dry beans category --- I need to do some serious mental preparation before feeding it to him again. About dogs and bones: I'm not sure about disease, but a search of the internet did suggest that bones could puncture intestines and cause a bacterial infection of the abdomen. However, another website notes: "Rawhide bones, green dental bones, and even pig ears have all been causes of intestinal obstruction in dogs as well. Though manufacturers of green dental bones claim the product to be entirely digestible, intact bones have been excised from dogs' intestines and have even caused a few canine deaths." Personally, I do lots of things that are slightly dangerous but are healthy in the long term if the 1% chance of disaster doesn't kill me. I apply the same theory to pet feeding, so we give Lucy all bones except cooked poultry bones (where I think the percentages tip in the dangerous direction). Nice!! I'm glad to see we're not the only crazy ones. Justin ended up killing six squirrels so far, but one was too torn up by buckshot for me to feel comfortable eating it. We only harvested the front and back legs and tiny backstraps of the remaining five (wasteful, I know, but I need baby steps), and put them all in the freezer for a few days. Yesterday, I parboiled the meat with some chopped onion, orange juice, pepper, salt, and water in order to prepare it for making stew. The meat came off the bones relatively easily (I was also pretty conservative and didn't keep any too-icky-looking pieces), and we both taste-tested it to see what it was like at this point. Honestly, it really did taste like dark-meat chicken to both of us -- quite flavorful and something that I could definitely eat right there if I were hungry. Today, I plan to throw the meat in a crock pot with potatoes, onions, carrots, celery, habaneros, garlic, tomato juice, lemon juice, chicken stock, and lots of seasoning. I'm baking some fresh bread, and along with a crisp salad, I think it will be very good! Mitsy --- I was trying to remember where I'd been reading about squirrels --- your blog! I think I should have worked harder at mentally preparing Mark for the meat rather than springing it on him. The trouble is, I'm so empathic that when he doesn't like something, even if I liked it originally, I suddenly don't like it. No good, huh? Squirrels are little more than tree rats. Y'all would be amazed were I to show y'all the damage they do to electrical and Cable TV system lines. Eat all of the squirrel you can, as far as I'm concerned. Thor --- That would make it much more inspiring to eat them up if they were doing that kind of damage! Bagged two today that were robbing my deer feeder, going to try a crockpot recipe for brunswick stew. Phil --- Sounds good! You may make our mouths water enough to try again. I hope it makes me a better squirrel fan haha. I remember now the biggest turn off for me is getting hair all over the meat while cleaning them... Maybe I just need more practice! I had intended to comment on this post a while back, but hadn't gotten to it. I've eaten squirrels most of my life. When in high school, I spent innumerable hours hunting squirrel to the chagrin of my dad and step-mother. I'd often eat them after searing over an open fire. Not exactly the best of meals, but hey... I was a teenager. Since then, we eat quite a bit of squirrel at my uncle's cabin in Mississippi. The best way I've found lately to cook them under primitive conditions is just to fry them with no batter in a bit of oil on a coleman stove. I find they're actually pretty good this way. I couldn't imagine eating them boiled though... that is the absolute worst way I could think of to prepare a squirrel. I'd take a squirrel roasted over an open pit fire any day over boiled. I bet if you tasted the meat prepared in a different fashion you'd be more pleased. My only gripe about squirrels is the amount of effort that goes into a usually small amount of meat. 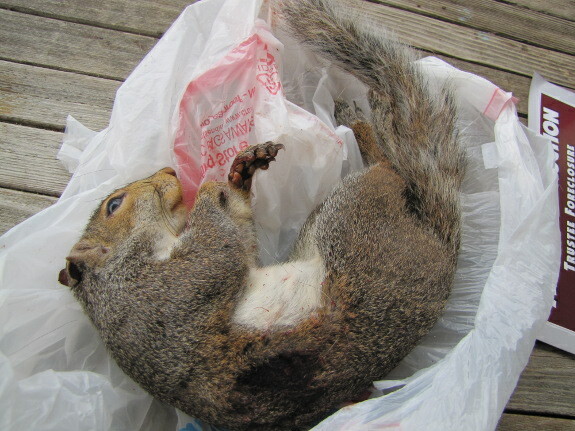 Unless one has a ready supply of fox squirrels, there's not too much meat on the critters. Shannon --- I think you're right --- I shot myself in the foot by boiling the squirrel. Unfortunately, that turned Mark off so much, he's not willing to try again. I'll have to learn and do better when I serve him his first rabbit! 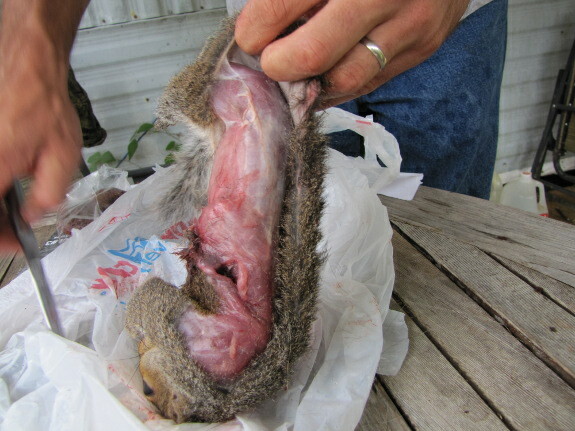 Phil- You can also dip the squirrel in water before skinning. It helps a great deal also. Now on the other hand squirrel can be cooked about every way you can think of. Two of my favorites would be squirrel dumplings and fried squirrel slow cooked in mushroom gravy. And I will say I prefer rabbit over squirrel, but usually the squirrels lose the bot fly before the rabbits here in mississippi. But happy hunting. Be safe n try new recipes that may improve your desire to eat them tasty bushytails. Oh man, I hate it when people shout the words "American" and "God" at me. What do politics and religion have to do with eating squirrel, anyway? It's like you're shoehorning your beliefs into a discussion where they do not belong, yelling at people who don't feel the way you do. I know it's a great way to get a lot of "likes" on Facebook, but what you don't tend to see when you do things like that is that it's also a great way to get a lot of people sighing and rolling their eyes at your behaviour. Yes, it's a great idea for people to know where their food comes from. It's an even better idea for them to at least know how to go about getting that food themselves. It's admirable if they actually do that.